HTC is among the few mobile manufacturing giants in the market, which is known to produce some of the best Smartphones. It has been offering a range of competitive phones that has been well-liked by the customers. Recenetly, it has launched its new phone One M9, which is expected to create a mark in India’s Smartphone market. It is one of its high-end phones from the company that comes with a number of advance features and claims to give competition to some of the giants in the mobile market. Let’s us have a look at the different features and functionalities of this beautiful phone, to see if it will be able to entice the Indian customers like its competitors. 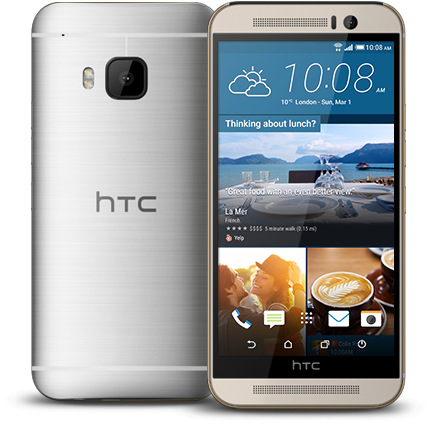 The new HTC One M9 shares the same design as its predecessor One M8 with a slight modification, which distinguishes it from its predecessor. The most evident and striking change is the new double-tone design. It has been wrapped in a metal body with a rounded back that has a plastic finish, which adds to its sturdy look and feel. The “BoomSound” speakers are positioned above and below the display offering amazing sound quality. The metal rear of the phone has an edge that connects it with the screen. The edges are more angular and elegantly rounded, which lends a classy look to it. The power button of this phone is moved to right side just below the volume button from the top. The design of the device is elevated with a glod colored edge, which adds to its look. It is a good-looking phone with a sleek design and amazing craftmanship. However, it is slightly thicker than One M8 and weighs 157g. In terms of design, it is definitely a flagship phone of HTC. The phone is available in three colors, namely Gold on Silver, Gold on Gold and Gunmetal Grey. Coming to the display, it has equipped this phone with a 5 inch LCD screen that is boosted with a 2k full HD display with as resolution of 1920 x 1080 pixels. The 2k display enables viewing of images and text with utmost clarity and the pixel density of 441ppi makes it crispier as well as sharper. The viewing angles are quite impressive and can be easily viewed even in outdoors withouth any difference. The new phone has been launched with the latest Android 5.0 (Lollipop) operating system, which makes it turely one of the high-end phones available in the Smartphone market. The phone is throughly customized with the latest version of Android skin Sense 7. The neat layout, user-friendly interface, well-spaced app icons along with the social network aggregator and BlinkFeed news that are positioned on the left side of the home screen, makes this phone truly an impressive one. The device is powered by two powerful processors, Qualcomm Snapdragon 810 1.5 GHz Quad-Core, Cortex-A53 & 2 GHz Quad-Core, Cortex-A57. The processors together with 3 GB RAM ensures glitch-free and smooth performance. In addition, the phone as well allows users to play high-end games as it is equipped with Adreno 430 GPU. 32 GB internal memory come pre-installed in this device, which can be further expanded up to 128GB using a microSD card. Today, one of the most important features of Smartphones is its camera. The new One M9 is equipped with 4Mp Ultrapixel camera on the front, which makes use of better pixels that is capable of taking in more light to deliver high-quality images. It also sports a 20 MP camera at the rear. The rear camera isn’t that impressive but with the help of its updated camera software, the images captured are pretty good. However, some glitches still exist and this can pose a major hinderance in the sale of the phone. Theimages captured from close-up are much sharper and looks quite decent. One M9 is a single SIM phone that comes with a Nano-SIM slot. It supports a number of sensors like Accelerometer, G-Sensor and Gyro Sensors. The phone comes with number of multi-media apps, which is quite impressive. The Home widget adapts the eight main apps on the homescreen, depending on the place the user is. The phone also comes with business features. The device can be connected with ease to DLNA attuned devices by making use of the three fingered swipe up on the screen. Peel Smart Remote is perhaps the best app on the phone, which enables users to control everything from sound system to TV and the set-top box of the television set can be connected using the infrared blaster, which is located on the top. It has dual-band Wi-Fi (802.11 a/b/g/n/ac) owing to the availability of Wi-Fi Direct and DLNA support. The presence of MHL 3.0, users can easily connect to the TV using cable as well as 4G. It also features 100GB of free Google Drive storage for 2 years. Besides these, it comes with Bluetooth 4.1, IR blaster, NFC, GPS and microUSB. It supports a wide range of audio as well as video playback formats such as Yes, AAC, AAC+, AMR, MIDI, MP2, MP3, WAV, 3GP, AVI, H.263, H.264, MP4. It also has FM radio that enables users to listen to music while on the go. The phone receives it power from a 2,840mAh Li-Po battery. With a single charge it offers up to 25 hours of 3G talktime and up to 390 hours of standby time. The new HTC One M9 comes with a price tag of Rs. 49,990, which is likely to compete with Samsung’s new Galaxy S6. After reviewing all the important features of the phone, it is undeniable that One M9 is an amazing phone from HTC. The features, design, display as well as performance look great. However, a little glitch in terms of camera can be easily overlooked. Over-all, this phone is worth buying, especially for those who are looking for a high-end Android Smartphone.